You know, I can’t decide whether we live in the best possible timeline because Little Witch Academia exists or if we live in the worst possible timeline since less than an hour and a half total of Little Witch Academia exists. Little Witch Academia: The Enchanted Parade is the kickstarted sequel to 2013’s anime darling Little Witch Academia. And like the original, The Enchanted Parade brings all the wonder and whimsy of a Studio Ghibli film but with the unique art style of Kill La Kill’s Studio Trigger. The Enchanted Parade once again follows the three young witches Akko, Sucy, and Lotte as they continue their education at Luna Nova Magical Academy. Unfortunately, the three friends find themselves in trouble after accidentally creating a monster in one of their classes. Their punishment is to plan for and participate in the nearby town’s “Witch Parade”—which in this case involves young witches getting pelted with tomatoes, pushed down a hill in a barrel, and dunked repeatedly underwater. As you might expect, this does not sit well with Akko, and so she decides upon a plan: to use the parade to show the normal people just how cool magic can be. Akko, Sucy, and Lotte are not the only trouble makers being forced to work on the parade. They are joined by Amanda, a thief who attempted to steal from the school’s vault just for the thrill of it; Constantze, a quiet witch who regularly mixes magic and machines to make forbidden technology; and Jasmineka, a food thief and habitual eater—regardless of the time or place. While the parade is the impetus that gets the plot moving, the real focus of the majority of the film is the toxic side of Akko’s personality. When it comes down to it, she is an immature and often spiteful child who becomes frustrated and downright hostile to anyone who does not view the world as she does. She generally assumes her friends agree with her (instead of asking their opinions) and will downright ignore anyone who questions the feasibility of one of her plans. Like all of us, Akko sees herself as the hero in her own story. Even when she does something obviously wrong, she rationalizes it with an “I didn’t mean to” and gets angry at those who are rightfully angry with her. Expectedly, this eventually serves to drive Lotte and Sucy away. But within her personality there is some good, too—a drive to do what she thinks is right even if she has to stand alone. Thus, she takes the parade project entirely on her own shoulders and does all of the hard work and planning as an apology to her friends. It’s hard for her to admit she is wrong, but if nothing else, Akko will fight for what she believes in—be that showing everyone the wonder of magic or mending her important friendships. The other main aspect of the story is one of world building. In the original Little Witch Academia, we saw a bit of how witch society works within the microcosm of the school. In The Enchanted Parade we see how the common people view witches. In town, the people have little experience with magic despite its proximity to Luna Nova. The Witch Festival which turns the brutal history of witch trials into fairground events—much to the physical detriment of the young witches who participate—is the biggest magic-related event in the town. This in turn affects how people view the witches. The trouble-making boys of the town view the young witches as disgusting and technologically backwards—i.e., eating stews made of various unsavory creatures in dusty old towers while having no idea what objects like cell phones are. To the boys, they are fit for nothing more than scorn and ridicule—and also being covered in tomatoes. The Mayor is hardly any better. He’s quick to disregard magical safety and historical monuments if they get in the way of progress—or his vanity. While he should be the bridge between the town and his magical neighbors, he doesn’t offer them even a modicum of respect. Even if the street toughs and the mayor are the minority, it is easy to see why Akko wants to change the townspeople’s view on magic. For Akko, discovering the wonder of magic changed her life; and she is therefore certain that it can do the same for everyone who witnesses the parade—even if using magic in such a way is seen as lowbrow for high-society witches like Diana. Diana’s role in The Enchanted Parade is that of star pupil and rival to Akko. But despite being cast in that role, Diana does nothing villainous. 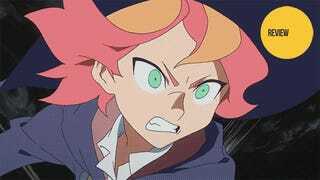 The only time she becomes particularly angry is after overhearing Akko speak badly of her behind her back—which is made worse as it is likely Diana was coming to offer Akko her aid in putting on the parade. Later in the film at Akko’s low point, Diana attempts to give Akko some tough love—though what is interesting is how hollow Diana’s words sound. Diana clearly dislikes being the perfect witch. She sees Akko and the other witches being so carefree and true to themselves that she is obviously envious—even as she looks down on them. From her reactions it seems that, deep down, she wants Akko to be better than her—to prove that there is another way to be a witch. Because then, it would be okay for Diana to look up to someone like Shiny Chariot. Speaking of Ursula, the superstar witch-turned-professor continues to help the students in a supporting role. When everything goes wrong, it is not her magic that allows the girls to save the day, but rather her stage experience—because if there is one thing the former Shiny Chariot knows, it’s how to put on a show. Now the only question is how long it will take Akko to put the pieces together and discover for herself that her teacher and idol are one in the same. As for the other characters, Lotte’s character is developed quite a bit. We learn about her past—that she was picked on for being a mage growing up. This is likely why she rolls with the punches so to speak, never losing control even as Akko leads her into trouble. Also in The Enchanted Parade we learn what is most personal and precious to Lotte—her music—as well as what it takes to make her snap. Sucy takes the role of the voice of reason. She is cold and logical, never angry, simply blunt. But this does not mean she doesn’t care for others—because if she didn’t, she would have abandoned Akko long ago. The mushrooms that she is obsessed with in The Enchanted Parade are the perfect metaphor to describe her: While many see them as poison, mixed correctly with other ingredients, they can become a powerful medicine. Little Witch Academia: The Enchanted Parade is the perfect sequel to Little Witch Academia. It builds upon the world of the original and develops the cast into multifaceted characters that are a joy to watch. Add to that its amazing, high-quality visuals and a story of friendship, understanding, and overcoming personal failings, and you get a short film on par with the Ghibli classics of old. Truly, the world is worse off if this is the last we see of Little Witch Academia. Little Witch Academia: The Enchanted Parade was released to its Kickstarter backers on July 3, 2015, and will be coming to Japanese theaters this October.